You can serve these nutty stuffing balls as an accompaniment to Christmas dinner or serve them as canapés with cranberry sauce. Pre-heat the oven to 180°C/Gas 4. Make the zataar. Chop the thyme and oregano. Toast the cumin and coriander seeds by placing them separately in a dry frying pan and frying until they start to smell. Tip them into a bowl and then grind them. Dry fry the sesame seeds for a minute to give them a little colour. Mix together the thyme, ground cumin and coriander, sesame seeds and sumac. Store any left over zataar in an airtight jar. Mash the beans with a fork. Fry the onion for 10 minutes until caramelising, then add the garlic and fry for another minute. Add the tomato purée and fry for another minute. Add the carrots and celeriac and fry on a high heat, adding the zataar and paprika as you fry. When the vegetables are soft, remove from the heat, stir in the chopped nuts and add lemon juice and shoyu to taste. Add gram flour or breadcrumbs to help bind and then shape the mixture into small balls. 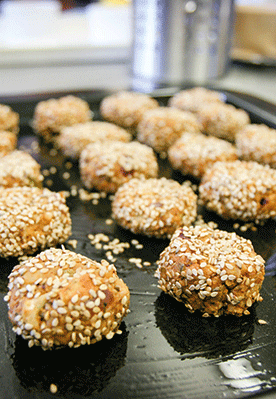 Roll in sesame seeds and roast in the pre-heated oven for 15 minutes until golden. Recipe courtesy of Demuths Cookery School. Visit www.demuths.co.uk. Image courtesy of Monica Shaw.